Summary: A traditional walk up to Ingleborough from Clapham via Ingleborough Cave, Trow Gill and Gaping Gill is followed by an unplanned return to Clapham on this comedy of errors walk. 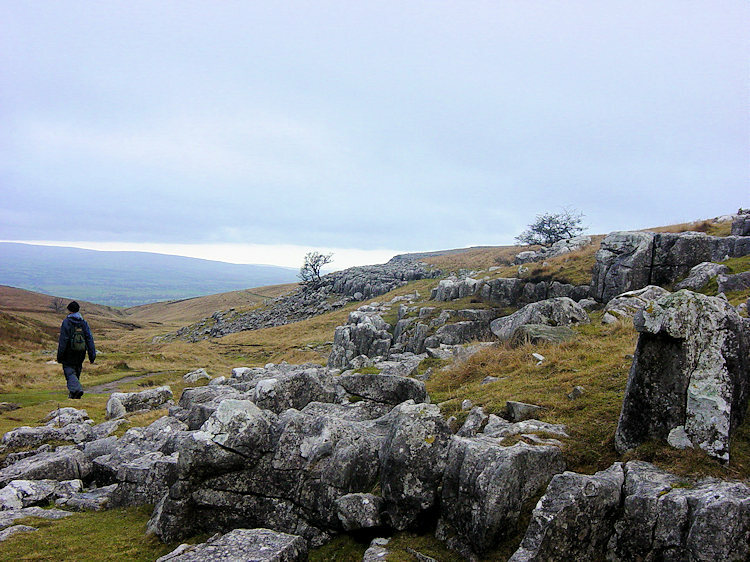 The intention was to return to Clapham by Sulber Gate and Moughton Scar, a walk through classic limestone country. That will have to wait now for the cloud on top of Ingleborough disorientated us so much that we walked of the hill in completely the wrong direction. At least the walk back to Clapham over Grey Scars was interesting. It was certainly unique. The original walking team was reunited. Steve had driven up from Somerset for a weekend of walking and other activities. 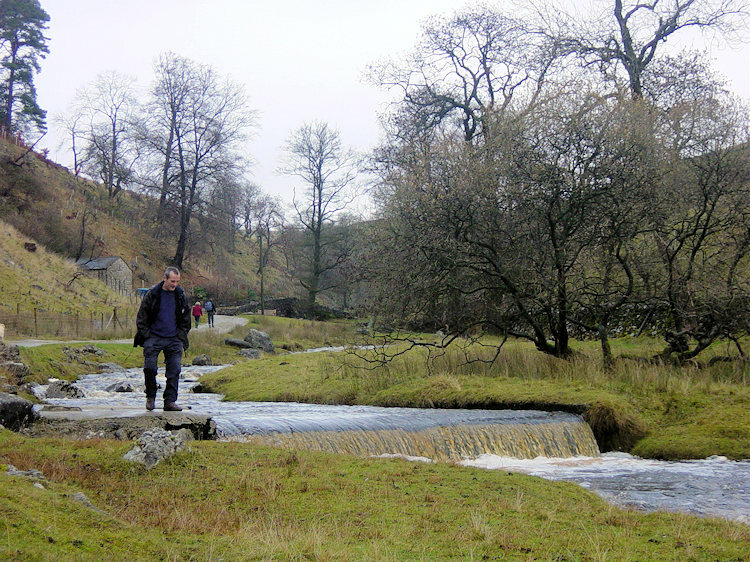 We had completed the first evening of other activities and were keen to get off into the Dales. 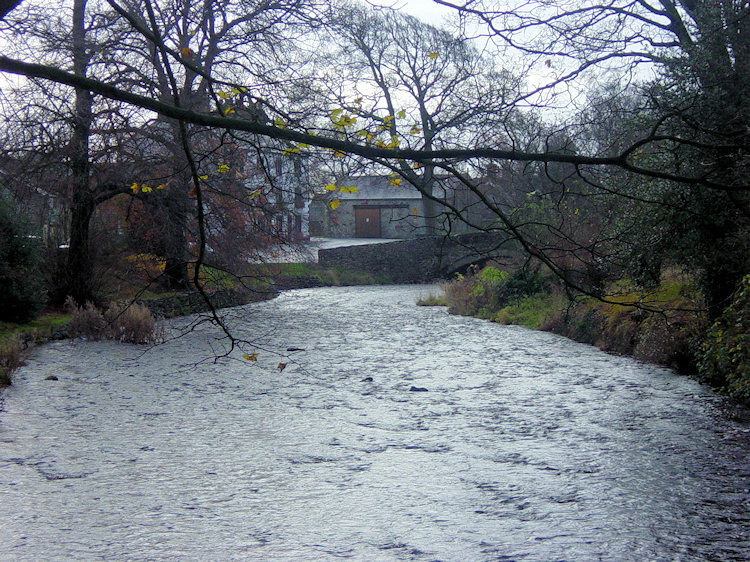 As Steve said as we begun the walk "Somerset is nice for a gentle stroll but there is nothing like walking in the ruggedness that you get in the Dales"..... or something like that. Sorry about the slight misquote. The weather forecast had promised a fine day with maybe the occasional shower. What it hadn't told us was that the cloud would lie low and that was to prove a decisive factor on the outcome of this splendid walk. We set off from Clapham in good spirits. It was clouding over after early morning sunshine but everything was still damp from Fridays atrocious weather. At least it was dry. 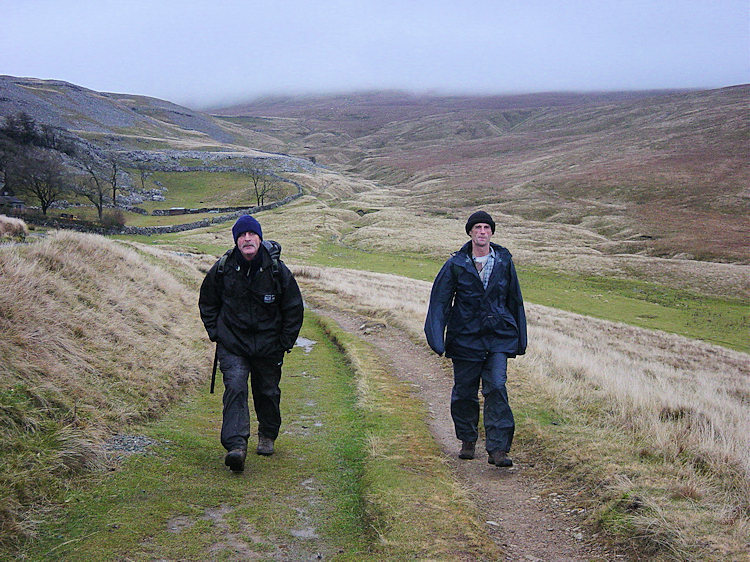 The walk from Clapham up to Ingleborough Cave is delightful in any conditions and the gradual ascent up Clapdale Wood clears the airways for the upcoming climb to Ingleborough. 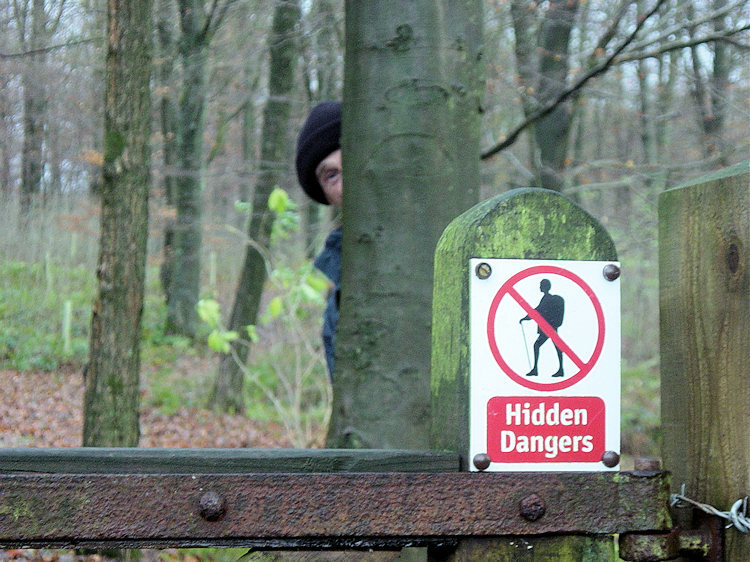 Walking through the woods we passed signs indicating hidden dangers (see picture). What dangers? One lurked behind a tree and I got photographic evidence of stalking Neanderthal man. Why are they carrying wood stakes? 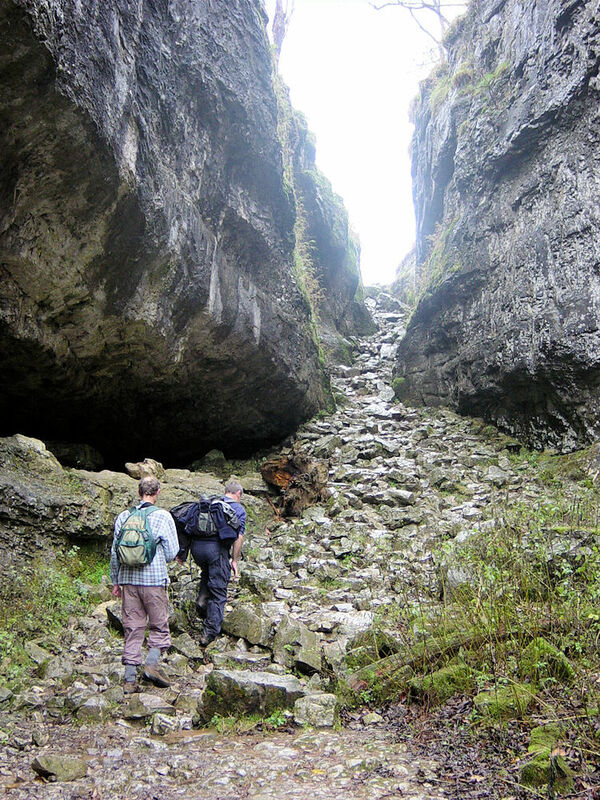 After walking up Clapdale Wood and then along Clapham Beck past Ingleborough Cave we reached the magnificent imposing ravine of Trow Gill. 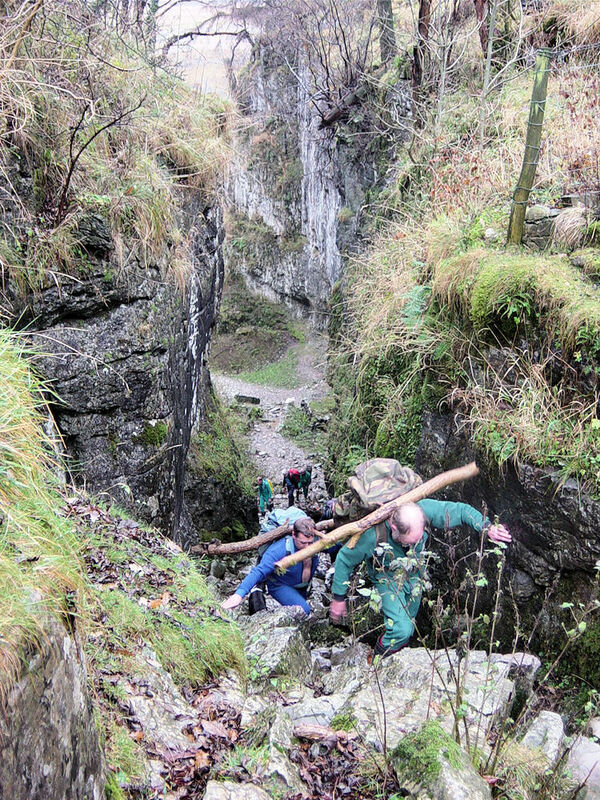 The walk through the gill with its sheer rock walls is completed by an easy scramble over fallen boulders. 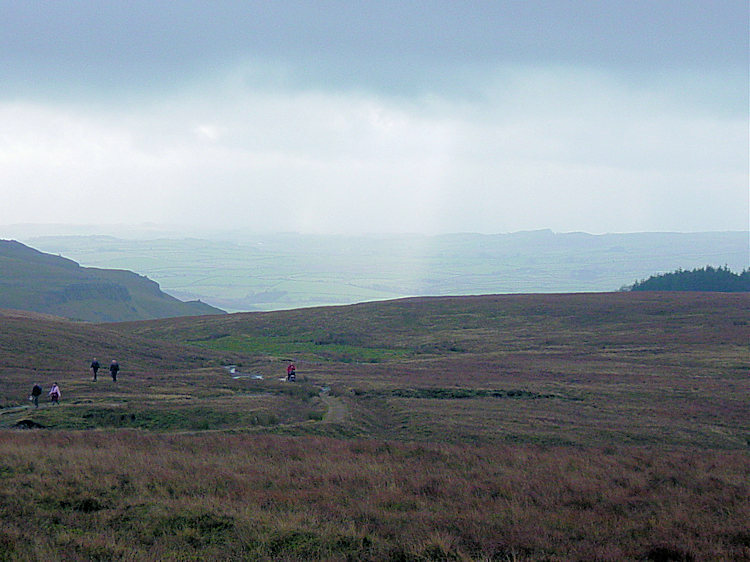 We emerged from the scramble onto the low fells of Clapham Bottoms. As we made height and reached open fell we saw the cloud base just above us. 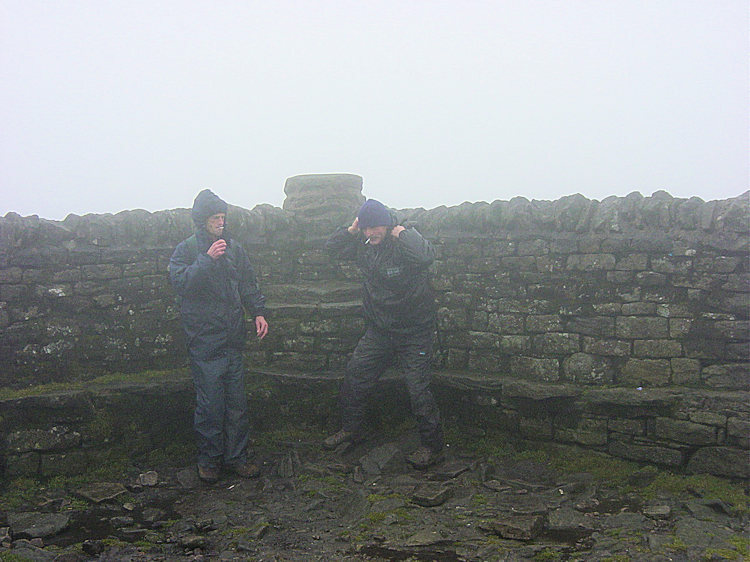 It was not going to be a day to get good views from the top of Ingleborough. Oh well, walks are good in all cases. 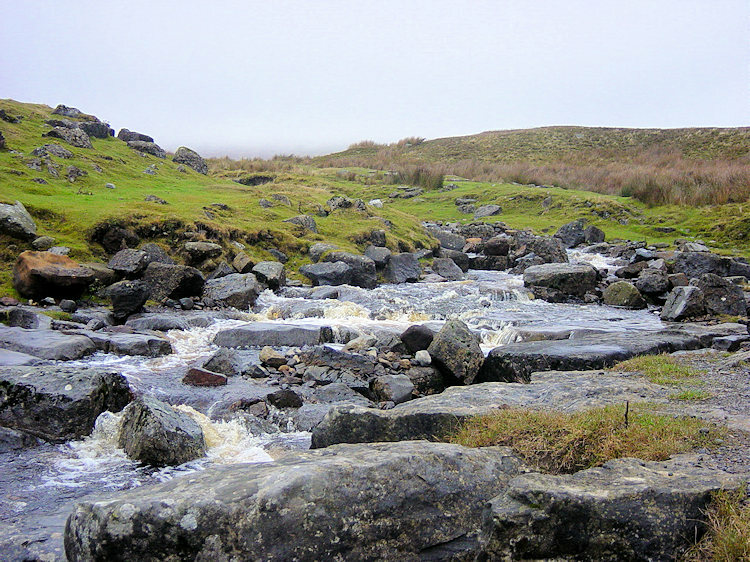 As Steve and Dave continued on the path up Ingleborough I detoured to visit Gaping Gill. 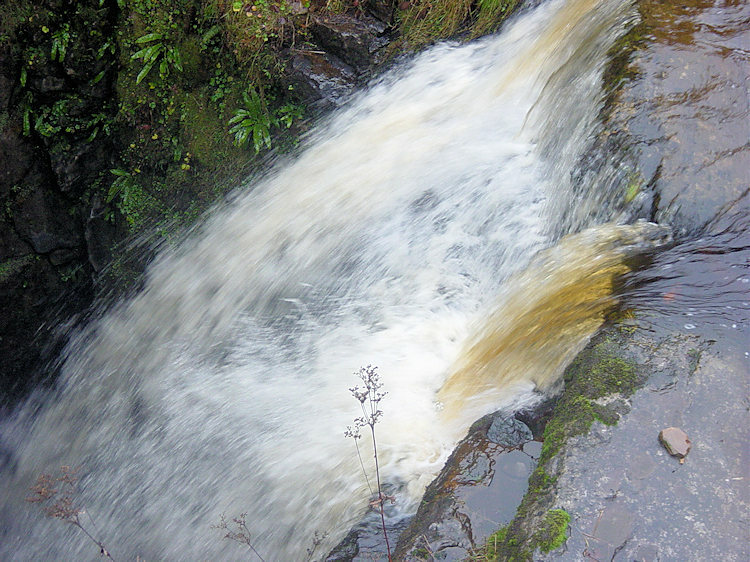 It was magnificent to see the water from Fell Beck howling down the chasm of Gaping Gill in full torrent. Not a day for the potholers. After standing in awe for a while I climbed back onto the path and made my way to catch them two up in the murky distance. We were in cloud now. We put our heads down for the final stiff ascent, Dave making the odd grumble about his aging hips. We are all getting older but it won't stop us continuing to test ourselves on the hills. It certainly won't stop me. 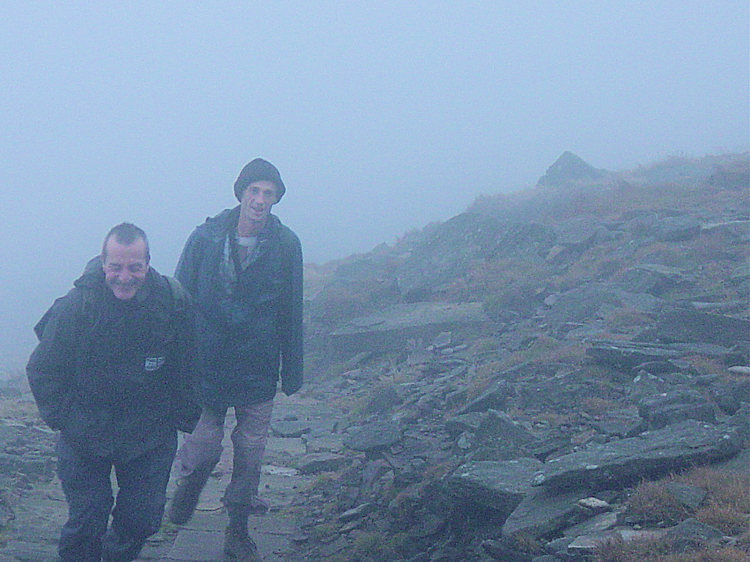 As we neared the top we couldn't see far at all and the wind was battering us too. After losing the two of them on top of the hill I met up with them at the rest point. I enjoyed a chopped pork and stuffing sandwich and a coffee. Food and drink is so much better sometimes and quite often the simple fayre is sumptuous in the right place. As it was here. The top of Ingleborough was not a place to dwell on for too long so after the food break we made a hasty exit off the hill. Alas, the path we took off the hill was completely the wrong one. We though we had just skirted the eastern edge of the hill and were making our way off it on the easterly path to Horton. 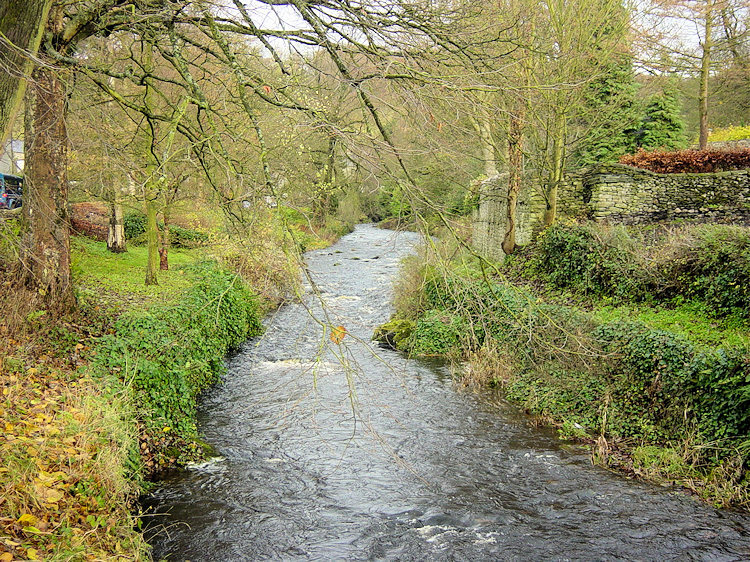 We were actually on the westerly path to Ingleton. Not just a few degrees out but in completely the wrong direction. Unbelievable and only as we dropped down out of the cloud did one of us begin to realise it. Dave was the first to realise and when we spoke to a lady on the ascent from Ingleton it still did not dawn on Steve and I that we were going in totally the wrong direction. 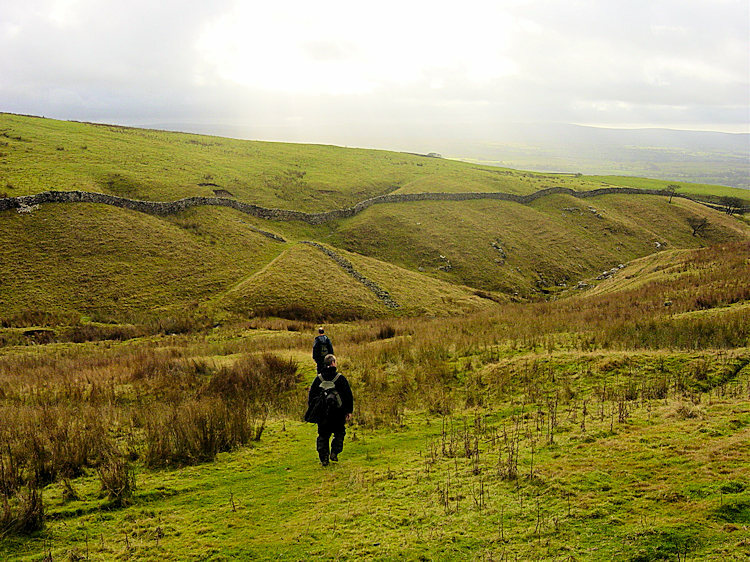 We continued past Crina Bottom and onto the walled bridleway into Ingleton. Steve and I were still not convinced we were going the wrong way but by now Dave was spelling it out to us. Only after we passed a sign to Slatenber which I found on the map did it finally sink in. Then I revised the walk and worked out a route back to Clapham. I worked out that from Slatenber if we kept height by sticking to the contours we were presently on and headed south then south east that it would take us past Grey Scars (SD730720). Steve and I were still totally perplexed about what we had done on Ingleborough and how we had ended up here. Dave explained his theory. We were still puzzled. We will never exactly know how we came to come off the hill on the wrong side. That's the fun of hill walking though. My revised route was fine and except for some walled obstacles it was a pleasant walk on good ground with great views to the south. In conclusion it was a good days walking and we can say we did walk some parts of the Yorkshire Dales that precious few others have ever done. And we did have a right good laugh too.